If ever there was a match that epitomised the continental way of playing, the Spurs v Swansea match has to be up there among one of the clearest pieces of evidence. There was no "throwing it in the mixer", hoofing it upfield or route-one football. There were rather two teams coached by two foreigners that keep trying to instill the values of keeping the ball on the ground and their passing short and sweet (even though both teams haven't been exactly Stoke-ish over the past few years). For the average English fan and/or viewer - used to more action-packed matches -, it must have been quite a hard penance. Swansea were at their best for the first 15 minutes. With Spurs trying to pressure high up and to keep their opposition from getting into their passing rhythm, Michael Laudrup's team were very good at avoiding ressure and looked extremely comfortable on the ball, including all of their back four, with De Guzmán doing excellent work dropping off in order to overload Spurs' midfield duo of Sandro and Dembélé. 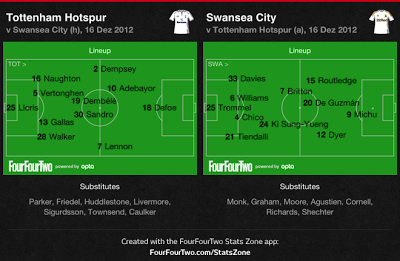 15 minutes into the match, the possession stats read 60% for Swansea, even though the match was at White Hart Lane. 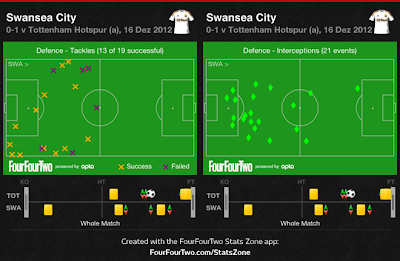 Spurs eventually found their stride and managed to disturb Swansea's passing patterns. Simultaneously, André Villas-Boas' men started finding the way to compensate for Gareth Bale's absence, with Adebayor roaming out wide and Clint Dempsey, originally deployed on the left, more and more central. Nevertheless, Spurs' chances were bound to come from the right flank, with Kyle Walker and Aaron Lennon the main providers. Dembélé, who excels at gliding past his opponents, was a bit off pace today, even though his game was very interesting throughout. With little creativity from midfield, AVB needed "drivers" - players who can push the team forward with sprints and take-ons, especially with Bale sidelined. Even though Lennon would seem to be the man for the job, his last touch and decision-making process keep letting him down, often squandering excellent opportunities. Despite the excellent start to their match, Swansea found themselves pinned back, the odd counterattacking menace notwithstanding. As stated when the Welsh team played against City, Routledge, De Guzmán and Michu are very good players, especially on the break - and there were clearly glimpses of that today. However, the fact that they were playing and defending so deep increased their difficulty at taking the game to the Londoners. This chalkboard offers clear evidence of Swansea's lack of penetration. Swansea found it very hard to get past the Spurs defence. In fact, Swansea were defending so deep that the number of tackles, interceptions and blocks made inside and near the penalty box would be more indicative of an Italian team playing their usual brand of counter-attack, something the Welsh were forced to by Spurs' growing pressure. This was indeed a much-needed victory for Spurs' aim to get into Champions League positions, especially after their dramatic defeat at the hands of Everton last weekend. Despite the good result, AVB still has much to do, since their team remain (a bit less, to be honest) prone to lapses of concentration while getting the ball out from the back and too nervous while trying to close up shop after they get ahead. Andros Townsend's display was positive and may provide relief on the wings for the manager (and Lennon, as well), who will also welcome Parker's return to the fold, particularly for the ever so demanding two upcoming weeks.